SOUTH CAROLINA PORTS: They handled 2.2 million TEUs in FY 2018, an increase of three percent over the previous year. SC Ports achieved the highest monthly volume in its history in June. SC Ports completed FY18 with record container volume. The South Carolina Ports Authority announced record container volume of 2.2 million twenty-foot equivalent container units (TEUs) handled during the 2018 fiscal year, an increase of three percent over the previous fiscal year. SCPA handled 201,163 TEUs in June, the single highest month for container volume in the port’s history and a 10 percent increase over June 2017. June was a strong finish to the Port’s fiscal year, which began in July. 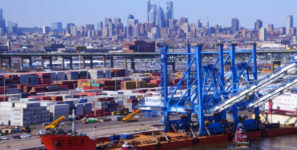 As measured in pier containers, or the number of boxes that moved across the docks of SCPA’s two container terminals, the port handled 115,696 containers in June and a total of 1.25 million containers in FY2018.